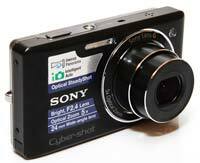 The Sony Cyber-shot DSC-W380 is a new 14 megapixel compact camera with a wide-angle 5x zoom and 2.7 inch LCD screen. Featuring a metal body, the Sony W380 offers a high-quality 5x, 24-120mm equivalent Sony G lens with a fast maximum aperture of F/2.4 and Super SteadyShot optical image stabilisation. Face and smile detection technologies are joined by a self-portrait mode, and there's also intelligent scene recognition and an Easy mode for complete beginners. The Sony W380 also features a Sweep Panorama mode for extra-wide landscapes, ISO range of 80-3200 and and 1280x720 pixel 720p HD movie recording with stereo sound and HDMI output. 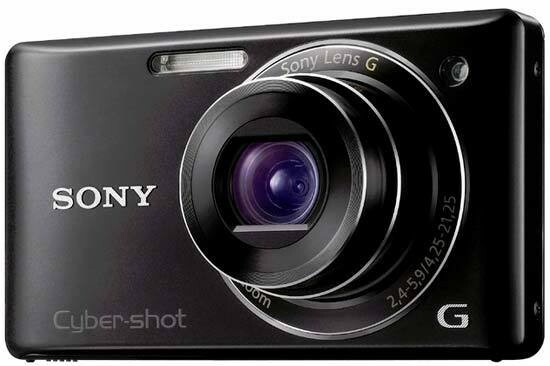 Available in silver, black, red and gold, the Sony Cybershot W380 retails for around £220. The new Sony W380 is heavily based upon the existing WX1 model, so a lot of comments that we made about that camera apply equally to the W380. 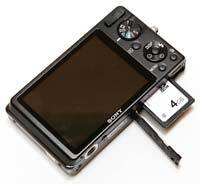 The Sony DSC-W380 has a conventional 5x extending optical lens with a fast maximum aperture of f/2.4 and 24mm wide-angle setting, instantly making it a serious proposition for more serious photographers. The W380's lens is a joy to use, with the combination of the f/2.4 aperture and maximum ISO speed of 3200 making this camera well suited to hand-held low-light photography. Also, having a 5x zoom in such a small package makes this camera more adaptable than you might first think, with everything from ultra-wide landscapes to candid head-and-shoulder portraits within reach of the W380. The W380 is quite a minimalist and slender camera, measuring less than 2cms at its narrowest point and weighing less than 150g with the battery and memory card fitted, with a 2.7-inch 230k-dot resolution LCD screen at the rear. As you'd expect with a screen of that size on such a small compact, the W380 has no optical viewfinder to fall back on. Providing the only actual means of gripping the camera is the round mode dial on the rear of the camera which falls naturally under your right thumb - there is no handgrip at all on the front of the rather slippery metal casing. Also located on the front of the W380 is the lens, a small and narrow window for the flash and a porthole for the self-timer/AF illuminator. Press the small round power button on the top plate and the Sony Cyber-shot DSC-W380 quickly readies itself for action in a just over a second. The adequately sized shutter-release button has a definite halfway point, determining focus and exposure with a bleep of affirmation, focus points highlighted in green on the LCD. Go on to take the shot and the JPEG images are committed to memory in a single second, the screen momentarily blanking out and then displaying the captured image before the user can go on to take a second shot. The W380's built-in microphone is also located on top of the camera, plus a small activity LED. A fairly responsive and tactile thumb-operated rocker switch on the rear of the W380 operates the 5x zoom and alternates between wide-angle and telephoto. The action of the zoom itself is leisurely smooth rather than rapid, gliding unhindered through the focal range in a single, steady motion. Underneath the zoom switch is the shooting mode dial, which has a nice positive action and lets you quickly switch between the various shooting modes that the W380 offers. In addition to the regular Program mode, Sony has included intelligent auto scene recognition in its line-up of shooting modes, accessed via this rear mode dial. This mode works in virtually identical fashion to the intelligent auto modes of Panasonic's and Canon's compact ranges. The user points the W380 at a scene or subject and the camera analyses it and automatically chooses one of 11 pre-optimised settings to best suit. For complete beginners, there's also the Easy shooting mode, which employs the same intelligent auto scene recognition system, reduces the number of features available to a few key ones and simplifies the display with bigger text and icons. Adding to its snapshot simplicity, these features join enhanced face recognition and smile shutter functionality on board, the former mode biasing human faces in the frame and the latter mode firing the shutter when it detects a smiling subject. The enhanced Face Detection system automatically adjusts the focus, exposure and white balance for people in the frame, and can even be set to distinguish between children and adults. Smile Detection, which is toggled on and off by pressing left on the navigation pad, offers three self-explanatory options, Big, Normal and Slight. Used in conjunction, the Face and Smile Detection systems do result in more hits than misses, especially in contrasty lighting conditions, although all those smiling faces could ultimately freak you out a little! New for the W380 are the self-portrait options in the self-timer menu, which work by automatically taking the shot with a two second delay after either one or two people have entered the frame. The now standard Sweep Panorama mode lets you capture a panoramic image very easily without the use of a tripod. All you need to decide is whether you would like to start from left or right, top or bottom. Then press and hold down the shutter release while doing a "sweep" with the camera in hand. Exposure compensation is available before you start the sweep, but the exposure is fixed once you depress the shutter button. After you are done with the sweeping, the camera does all the processing required, and presents you with a finished panoramic image. The catch is that it's of relatively low resolution: the shorter side is invariably 1080 pixels, whereas the longer side is 4912 pixels for a 'standard' panorama, and 7152 pixels for a 'wide' one. Note also that if you do the sweeping too slowly, or you let go of the shutter release button too early, the panorama will be truncated. Underneath the mode dial, you'll find a small button for playing back your images. Users have the ability to dip in and out of created folders of images or the calendar view, view thumbnails, select slideshows and choose transitional effects and accompanying music, or delete shots. Press the shutter button halfway and you're helpfully catapulted back into capture mode. And that's basically it. With a press of the Menu button in playback, users have access to a few in-camera retouching effects, including the ability to crop and sharpen an image and apply red-eye correction. There's a traditional round navigation pad on the rear of the W380 which you can use to navigate through menus and options, in conjunction with the small button in the middle which activates whatever it is you've chosen. The four directions on the navigation pad also provide a quick way of setting the Display, Flash, Timer and Smile Shutter options. Finally, there are buttons for the camera's menu system and for deleting images underneath the navigation pad. The menu button accesses most of the camera's main functions - shooting mode, image size, burst settings, EV, ISO, white balance, Focus mode, Metering Mode, smile detection, face detection and Dynamic Range Optimiser - plus an icon at the bottom to open the four Settings menus. The latter includes the ability to deactivate the camera's 'bleep' that otherwise sounds at every button press. Sony has fitted a dual image stabilisation mechanism in the shape of both optical SteadyShot and an ISO range that extends up to ISO 3200. If not quite class leading, it's better than you'll find on an average point-and-shoot - you can see some examples on the Image Quality page. Note that you can't actually turn off the SteadyShot function. As with its recent predecessors, present and correct on the W380 is the increasingly ubiquitous ability to shoot High Definition video clips at a maximum 1280x720 pixels video at 30fps, here in PC friendly MPEG-4 format with full use of the optical zoom. The movie mode also has its very own underwater shooting mode, plus the ability to change the EV level, white balance, and metering options. There's also a direct HDMI output from the camera, useful for playing back the 60 minutes of footage that can be stored on a 4GB Memory Stick (Duo or Pro variety), although sadly there's no HDMI cable supplied in the box. The bottom of the Sony W380 features a standard screw thread for attaching it to a tripod, which is rather inconveniently located in the corner. Alongside this is a narrow flap with a rather flimsy plastic lockable catch that protects the shared lithium-ion battery which provides a merely adequate life of 220 shots. 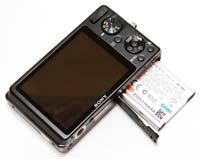 The same compartment also houses the removable memory card, with Sony now supporting the SD / SDHC format rather than their own proprietary Memory Sticks that they have persisted with for so long. There's also a hardly worth it 11MB internal memory to fall back on.